Many runners will say that their favorite running season is autumn. The crisp air, the kaleidoscope of bright colors, and the crunching under the feet just call for a run. Probably you are thinking now: yeah right, what about the grim weather and gloom? We all know that in fact there is no such thing as bad weather, but only bad clothing. Well, just like every season in the year, there are a few quirks to running in autumn that we want to point out for you. 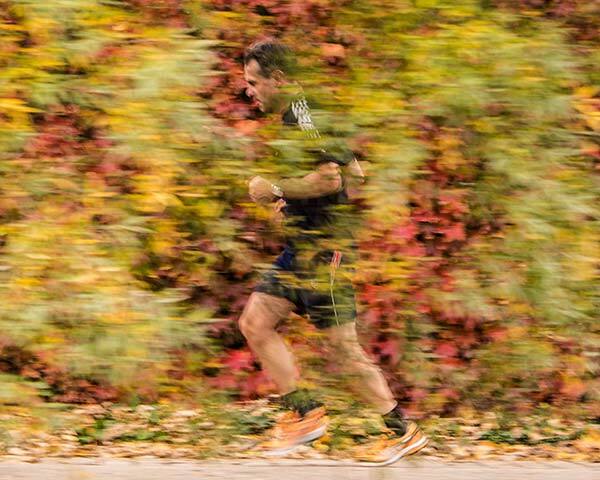 Enjoy our autumn running tips. Cooler weather means your body will not be ready for action as quick as e.g. in summer, so add extra time to your usual warm-up routine. Start slow and pick up the pace gradually from walking to running. Do not rush. Focus on longer and calm runs rather than sprinting. If you do stretching and strength exercises after the run, do them in a warm place or at home. Change into dry clothes as soon as possible. Think of how hard it will be to come back in spring after four or more months spent sprawled out on the couch while looking at the grey weather through the window and drinking hot chocolate. All your previous summer workouts will seem useless and you will have to re-start from scratch. Still no motivation? Change your regular running routine, explore new trails, and start running with a friend or in a group. Experiment. Just because it is autumn it does not mean you should stop drinking, even if you are not thirsty. Good hydration will prevent cramping. Many runners think they have to show their calves in colder months, but their tendons and ligaments cannot be thrilled about that. It is simple physics: cold contracts and heat expands. Due to colder temperatures your blood circulation decreases and makes your skin, tendons and joints less flexible and more prone to injuries. Therefore it is important to wear appropriate and functional clothing and underclothing, like long tights and a long-sleeved top in bright colors and reflective material.